Amongst the younger generations in the Wagga of today, he has largely passed from memory. Small hints of his presence exist only in the city's main street, which is named in his honour, and fragments of his life story appearing as little more than a postscript in local history books, alongside other prominent identities. Amongst his other achievements, Henry Baylis was Wagga's first police magistrate. Perhaps the most exciting episode of his life occurred in 1863, when he played a conspicuous part in subduing bushranging in the Riverina region. In August 1863 Baylis had a famous encounter with bushranger Dan Morgan and his associate Clarke. The following is an account of this chance meeting between magistrate and outlaw, as recounted by Henry Baylis to his wife Sybella - from the original letter held in the collections of the Museum of the Riverina. I said "Blow Away!" and gave Pathfinder [his horse] the spur. They fired two shots at me, and I got beyond their reach. Baylis then rode for about three miles, until he came upon a man camped on the roadside. He pulled up and asked the man if he had seen two men passing up the road. The man informed Baylis that the two men had passed his campsite the previous evening, and were in possession of two grey horses. At that moment, Baylis heard the gallop of horses coming down the road, and from the corner of his eye, caught sight of a grey horse. Baylis immediately started into the bush, hoping to dodge the pursuers in the scrub. They came after him shouting. After a ride of about a mile and a half, the men overtook the magistrate and the first rider pointed a revolver directly at him. Baylis drew his horse to a stop, and was ordered to dismount, which he did. The second man then came up, and covered Baylis with a double-barrelled gun. The first man then ordered Baylis to surrender his money, and he handed over his purse. He then demanded his watch. Baylis answered that he had never carried a watch in his life. The first bandit asked Baylis "Did you think to get away from old Bush Riders like us by taking the scrub? ", to which he replied that if his horse had been anything but an old screw, he would have bothered them to catch him. Baylis carried only three shillings in his purse, and a cheque for two pounds. The bushrangers were disappointed to discover this paltry amount, especially when Baylis revealed that was all he was carrying. Morgan and his accomplice then asked Baylis what his profession was. He said "Police Magistrate of Wagga Wagga, and my name is Baylis". Morgan replied "It's all very well to say that you are Police Magistrate, but what have you got to show for it?". Baylis showed him proof in the form of letters he was carrying to Urana. Morgan then asked Baylis why he did not stand when they asked him to. Baylis replied he did not know that they had horses, and that he did not like being stuck-up without making some attempt to get away, as there was no honour in such an action. Morgan, impressed, said the chase was great "game", but that Baylis should not have run as they may have shot him. Baylis then took a seat, whilst the two bushrangers ransacked his valise, and the leather case which he carried his court books and documents in. These searches were not fruitful. Morgan was disappointed, expecting to find a lot of money considering the desperate effort made by Baylis to escape. Baylis stated "Why, you did not expect a Government Officer to have any money did you!?" Morgan then decided to detain the magistrate, for fear that he would spoil the road for them, by warning other travellers of their presence. Baylis reiterated it was most necessary for him to travel to Urana, and then back to Wagga Wagga, and that he would consider it a great favour if they would let him go. Clarke handed Baylis back the purse, complete with three shillings, but kept the cheque. The two bushrangers then huddled a short distance away, conversing. Morgan then returned to Baylis, and held out the cheque, saying "There Sir, you are non the worse for having met us, and if we come before you I hope you'll be easy with us". Baylis replied that if they came before him [in an official capacity] he would be required to do his duty. To this, the bushranger replied "You must do your duty, and we must do ours. Good morning Sir". They then parted ways. Baylis decided after this encounter that he had to make every effort to capture these two men. A few days later, accompanied by a party of police and volunteers, Baylis found the bushrangers' camp not far from the present site of Lockhart. In the ensuing encounter Baylis and Clarke were wounded, the latter fatally, while Morgan was apparently unhurt. 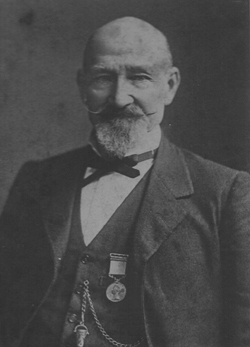 For his efforts in helping to track down the bushranger Daniel "Mad Dog" Morgan, Baylis was awarded a gold medal by the Colony of N.S.W. The bullet, the only physical reminder of this legendary encounter between two men on opposing sides of the law, was presented to Henry Baylis by his brother magistrates upon his retirement from the bench. The slug was enclosed in a gold casket, which Henry Baylis wore suspended from his watch chain as a good luck charm. 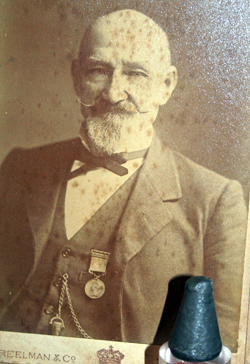 The Museum of the Riverina holds the original bullet, medal and other personal mementoes belonging to Henry Baylis in their permanent collection.